I’m fascinated by the Caseme Case. When I read this case was designed using the golden ratio, I had to try it out. 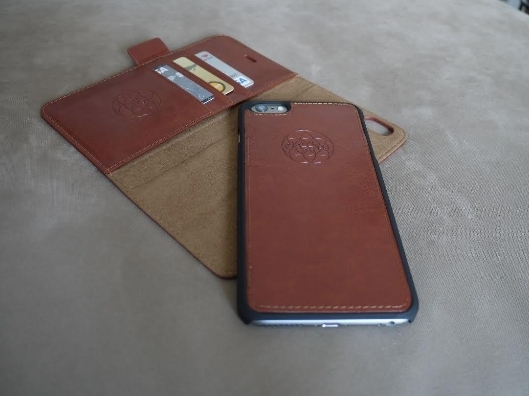 Starting with the cleverly designed logo inscripted over the embossed flower of life based on the Fibonacci ratio, down to the softness, shine and smoothness of the leather covering the case, this work of art is a joy to the touch. It has an inner case that tightly hugs the phone serving as a potential impact absorber. It will come in handy when you drop or smack your phone against something. Everyone’s bound to do it sometime. For all the added protection it’s surprisingly light. The inner case’s edge has a velvety rubbery feeling. It secures the phone with a magnet I find amusing to stick and unstick when I’m pensive or anxious. The entire case is a monument to mindfulness. The wallet case fits nicely in my small hands and pockets. I can close the case with a swift snap in less that a jiffy with one hand. A feeling of relief came over me when I inserted my stash of cards and IDs and I was able to whip them right back out. At last, someone solved the perpetual too-tight-card-pockets by giving them extra horizontal room to tilt and pull. There are a few of more things worth mentioning that make phone use an easy cruise controlled activity. Ear speaker opening, you can answer your phone without having to open the case and extract the device. Extra wide port openings make it handy to connect and disconnect cables.